Well, last night I registered for the Casper Marathon. Unfortunately, I registered for the race before checking the weather. Oops. After clicking submit, I decided to check and right now they are saying there is a 30% chance of rain (with potential for severe thunderstorms) and a high temperature of 78 (a low of 47). Temperature-wise, not a bad range but I am worried about the rain. I am not sure if it would've stopped me from registering for the race, but it certainly would've given me pause. It was hard not to run last night. It was cool out and I needed a stress reliever. I did wind up walking a few miles on the bike trail (2 to be exact) so I could let off steam there. I always forget that the last couple of weeks before a marathon, I really watch what I am doing and eating. The taper is always a test of patience and nerves and you really have to baby yourself in the last two weeks -- especially if you want to run well and feel fresh at the starting line. I have to remember that basically there is NOTHING I can do in the final 2 weeks that will improve my running but only hurt it. So this past weekend with the weather extremely nice I was just itching to go climb a mountain but I decided I didn't want to put any more strain that I had to on my system. The last mountain climb I did I felt a little bit of tiredness until Wednesday. Also, the crazy thing about the marathon is you start getting phantom injuries and you start to notice little aches and pains. I woke up last night to use the restroom and as I wandered into the bathroom, I was concerned because my Achilles on my left foot felt tight. I probably spent the next 15 minutes examining it and was panic stricken that I might've flushed another race entry's money down the toilet because of a cranky Achilles. 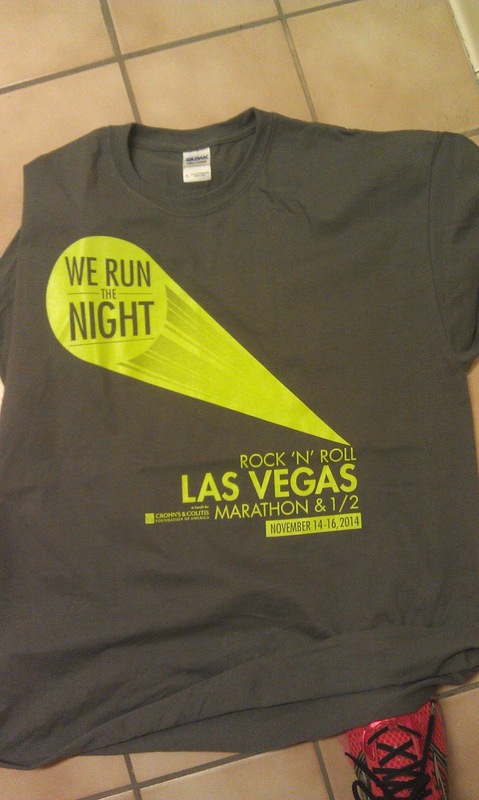 On another note, about a month ago, the Las Vegas 2014 Marathon had a virtual 5K race. You basically signed up for it, promised to run a 5K on your own, take a picture of your Garmin or treadmill and report in with your time. In return for this "free" event you got a t-shirt. Excited for another piece of Las Vegas swag (I've got a lot of it) I signed up but never got a subsequent email on where to report my 5K run. I remember the day of the virtual race I ran a 20 mile training run, so I certainly covered the distance. Sadly there was no question / answer person to send an email to either. Sadly I figured it was a lost cause and thought nothing more of it -- until yesterday.